A few months ago, I wrote an article of packaging materials for online sellers and in it I go over the best options for different products – boxes, jiffy bags, mailing bags etc. BUT since then, I’ve received probably hundreds of emails from sellers asking me where to buy this stuff? So I’ve decided to, once and for all, create a full comparison for you that you can refer to whenever you need to order packaging materials! In this guide I’ll be comparing the big 3 options – eBay, Amazon and ecommerce sellers. But I won’t just say “go to eBay”, no – I will tell you exactly where you should go to get the cheapest price possible for your packaging, after all – overspending here won’t give you any benefits for your business and it’s simply an unnecessary expense. 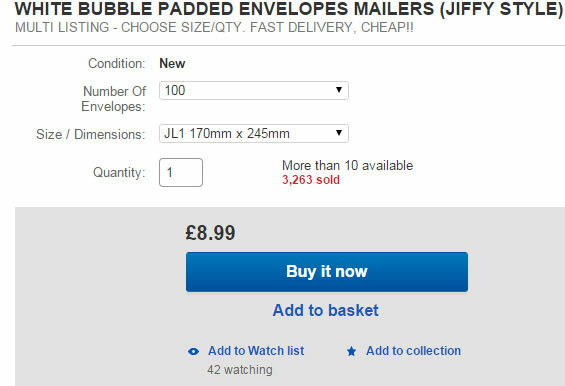 The jiffy bag I’m going to be researching is probably the most commonly used by eBay sellers – the JL1 170mm x 245mm (‘DVD size’). 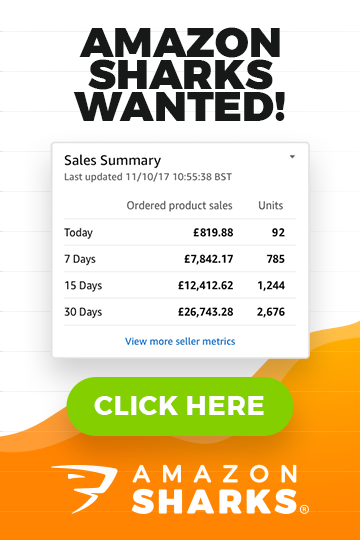 Now I always like to start my research on eBay, as it’s the quickest and easiest way to compare multiple sellers at once and to get a good idea of the average pricing, whereas in comparison you would have to go through hundreds of ecommerce stores. So I start off by simply searching JL1 jiffy on eBay. Now ignoring the multi-item listings for now I can straight away see that the price for 100 of these on eBay is around £11 (a little bit less). Next I’ll go through the first few results, which were multi-item listings, and see if any of them offer better pricing. But as you may have noticed, these are described as “jiffy-style” in the description title which means it isn’t an official Jiffy Airkraft but as it’s simply a padded envelope (your customers certainly won’t notice the absence of the Airkraft logo on the back) and most importantly, the seller has very good feedback (99.9% positive with just under 80k feedback), I think it’s safe to assume they’ll be of a good enough quality. 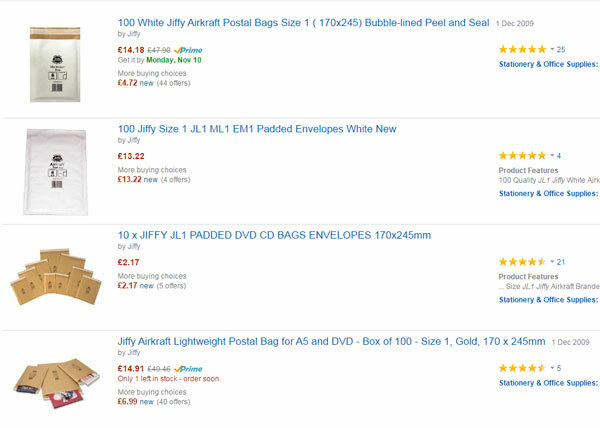 But in the interest of fairness I’ll also note that the cheapest actual JL1 Airkraft Jiffy bags that can be bought on eBay are here, at £19.39 for 200. That gives a price of just under £0.10 per jiffy bag. Next let’s move onto Amazon and see if any sellers there can beat our eBay pricing. But there is a listing for the slightly larger Mail Lite equivalent (Mail Lite are the other major manufacturer) at only £9.99 delivered for 100, which is a pretty good price considering these are also a little bit bigger at 180mm x 260mm. So far eBay and Amazon have been pretty equal with a few different options (Mail Lite vs Airkraft vs Unbranded) so last but not least, let’s see if there are any eCommerce stores that can beat them. 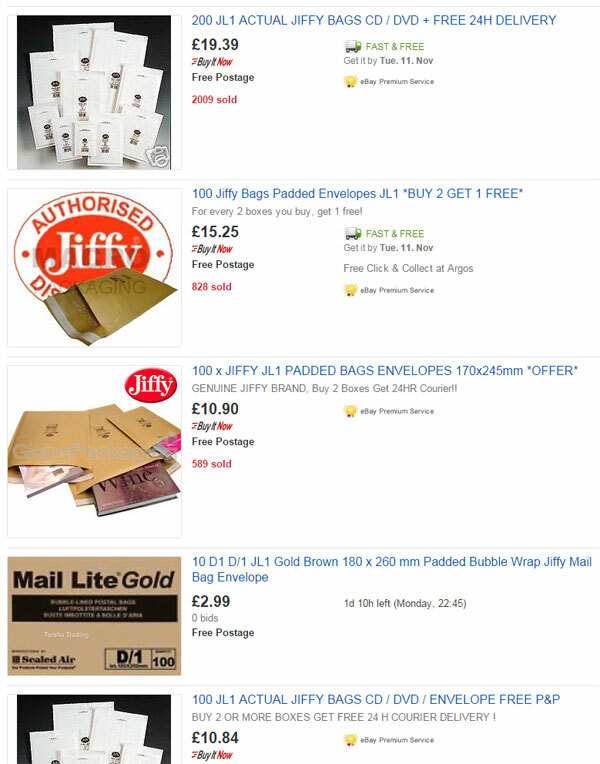 I search on Google and click on one of the sponsored adwords listings at the top which takes me to cheap-integratedlabels.co.uk where they’re selling own-brand white padded envelopes and initially, the prices seem AMAZING! So please always bear this in mind when searching on eCommerce stores – most of the time the price shown is ex-VAT and before shipping, which is exactly why I said earlier that it’s always easiest to start on eBay due to how easy it is to compare different sellers. Well unfortunately not as nearly all the eCommerce stores I checked were either much more expensive or at best, still a bit more at around £11+ per box of 100. 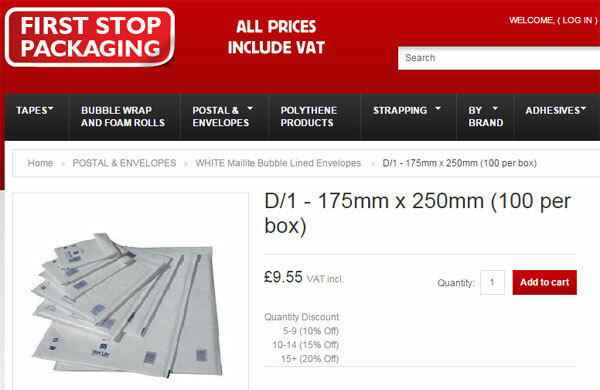 One store, firststoppackaging.co.uk, did have some very good pricing of £9.55 per box of 100 Mail Lite D/1 envelopes, but they only offered free shipping on orders of £25 and above, which means ordering 3 boxes at once. And that means that at the end of Round 1 of our price comparison, it’s a draw between eBay and Amazon. The next item up for comparison is the ever-reliable cardboard box. Of course, as with jiffy bags, there are countless sizes available, so in order to make it a fair comparison – I’m going to be looking at the maximum sized cardboard box for Royal Mail’s small parcel pricing, which is now 45cm x 35cm x 16cm. As before, let’s head to eBay first to get started! But before that, let me quickly state that with cardboard boxes, you can get either single wall or double wall, and there’s a big difference in quality (as well as price!). As the name suggests, double wall offers much more protection and is suitable for heavier and more fragile items, so please bear that in mind when you’re doing your research. As you can see, in this case you save about 20% on the cost per box if you buy 100 instead of 25, and that’s the case with pretty much all packaging supplies – the more you buy at once, the lower the price you get. And that’s why I always suggest buying as much as you can at one time. Use your common sense of course as the last thing you want to do is blow your entire start up budget on boxes, but when you’re at the stage that you know you’re going to be needing, say, 200 of these boxes in the next few months, then buy two hundred at once. Not only does this save you money, it also means you don’t have to constantly worry about your packaging supplies and can concentrate on the more important aspects of your business. Next onto Amazon and here it takes a slight loss against eBay as there is only one seller for this box size and their pricing isn’t as competitive as Globe Packaging. They offer 25 boxes for £21.49, 50 boxes for £34.99 and 100 boxes for £59.99 so in all instances it’s cheaper to buy from eBay and really that’s to be expected considering the lack of competition for packaging materials on Amazon. And then finally, we move onto eCommerce again to see if any site can stop eBay getting another win. And that means that for round 2, our winner is eBay! Time to test the pricing for mailing bags now! Mailing bags are already an incredibly cost-effective packaging material so I wouldn’t spend too much time trying to shave off those extra pennies! 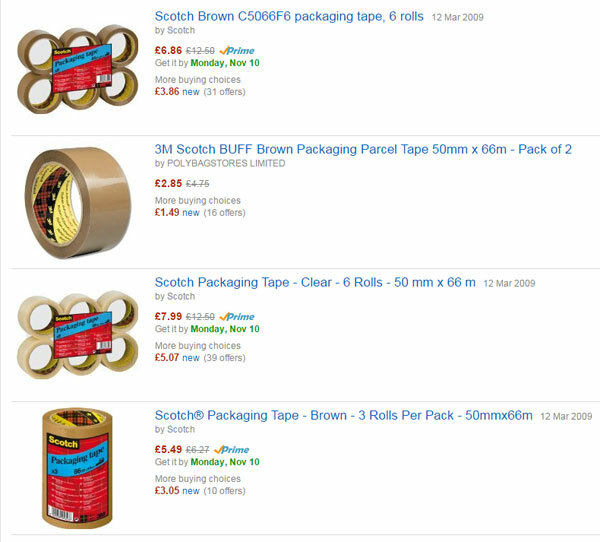 The cheapest listing for a small quantity of 100 is packaging.products.direct at £6.49 delivered. And then if you want a larger quantity of 500 mailing bags, neopostal works out a fair bit cheaper at £22.99 or 1000 pieces for £35.95. So as you can see, mailing bags really are incredibly cheap with a cost per piece of around 3.5 pence on a tiny £35 order. Of course this is because they offer much less protection than cardboard boxes or even jiffy bags and are not suitable for all products but if you do sell something that would be okay to post in a mailing bag, then that’s a great way to save some money on postage costs. And now onto Amazon and for the smaller quantity of 100, there is a seller offering them for just £5.13 delivered, which is 20% cheaper than eBay! 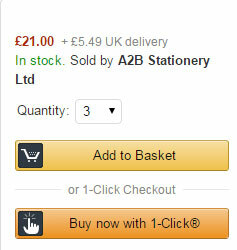 However for the higher quantities, there aren’t many sellers on Amazon and none come close to the pricing on eBay. And finally with eCommerce it was more of the same (I’m starting to sense a pattern here!) and even when going up to quantities of 5000+ I couldn’t reach the per piece price of neopostal on eBay. Which means that overall round 3 goes to eBay, with Amazon slightly cheaper if you only needed a very small amount. And that’s it for our price comparison of the 3 main postage materials for online sellers – jiffy bags, cardboard boxes and mailing bags. To be honest the results are pretty much exactly as I expected, with eBay cheapest on most occasions (though sometimes Amazon if there’s a good deal on) and ecommerce stores simply unable to compete on price. That is why I have always said “go to eBay” for your packaging supplies! Only if you’re ordering HUGE quantities or need custom cut boxes or custom printed mailing bags should you start looking into other suppliers. Until then stick to eBay as I’ve always maintained (though I hope you’ll finally believe me after these real-life examples!). Just to make it a complete price comparison for shipping materials, we’ll take one final look at a couple of must-have items – bubble wrap and packing tape! Bubble wrap is usually sold in rolls so there are two measurements you need to look at when buying – one is the width which is usually either 300mm, 500mm, or 750mm and the other is the length which is basically how long the roll is. In this example, we’ll use the middle ground of 500mm wide bubble wrap. Note – there are also different sized bubble roles but as small bubbles are by far the most common for online sellers, that’s what we’ll be researching here. On eBay the cheapest seller for a 50m long 500mm wide roll is postal-online at just £5.75. It goes without saying that 50m is a LOT of bubble wrap (the length of two swimming pools!) so again, the cost is really negligible per item sent. 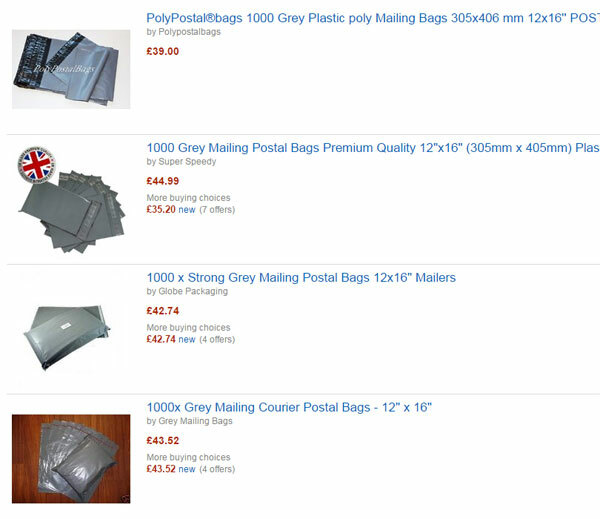 Amazon once again beats eBay by a very small margin, with PolyPostalBags offering the same amount of bubble wrap for £5.26. The most common roll size for packing tape is probably 48mm wide x 66m and just like with bubble wrap, the cost per item posted is miniscule. You can pick up 12 of these rolls for £6.48 on eBay. 72 rolls for only £29.88. Considering that a single roll last hundreds of orders, this is very much an order once and forget about it item! It feels like a foregone conclusion at this point, and as expected – I couldn’t find any ecommerce stores that could compete on price with eBay. So that brings our pricing comparison to an end. To conclude; it’s as I’ve always said – the cheapest suppliers for packaging materials are nearly always on eBay (and occasionally Amazon but the choice is far less). You could possibly find cheaper suppliers online if you spent hours upon hours searching but then, what’s the point? Simply head to eBay, and order it from there, knowing that you’re 99.9% getting the best price available. Now I know what you may be thinking – but the quality on eBay is probably really bad? And to a degree, yes that’s true. On average the materials you buy from eBay will be worse that the branded ones available online but as long as they do the job, then that’s fine! As you can see, all the sellers featured here have great feedback so it’s extremely unlikely that you’ll receive products that aren’t fit for use. So that leaves me to conclude that unless you’re ordering HUGE quantities or need very specific packaging materials (such as custom sizes, colours or printing) then just keep things simple and order from eBay! After all, this is by no means something that will make or break your business so just order enough supplies to last you a few months at least and then get on with more important things in your business – like making sales so that you actually have a use for all that tape and bubble wrap ;-). It’s always best to go direct to a UK manufacturer rather than a middleman, wholesaler or supplier. We have been the cheapest on eBay, amazon and online for corrugated cardboard boxes for the past several years. Our website is always the cheapest option with free next day delivery on all our products, best of all we don’t scrimp on quality using only the highest quality board. For the average eBay seller the single wall boxes are ample enough but for the more valuable items we would always recommend a double wall box that is thicker and stronger! We also provide your logo on our boxes and can design any style, shape or size box (we have a maximum size for our machines) with almost any design and logo printed on the box for larger sellers that require brand awareness. If you need cardboard boxes boxed-up.co.uk are a Wigan based uk manufacturer. I buy 5 boxes which work out at only £5.98 per box including next day delivery. Hi Andrew, I’m just getting into selling on eBay and so I wanted to thank you for your helpful post. It’s pointed me in the right direction as regards packaging materials as I really didn’t know what I needed or where to begin. You’ve been a big help – cheers! Thank you for the article I have found it very interesting but I have to say that you really in my opinion dismissed the important factor when talking about packaging and it is the quality of the product. I have been buying packaging and all of the products that you have discussed. If I start with the padded bubble bags, you do mention that there are branded products and non branded products but other than the wording on the envelope there is a massive difference with the products. 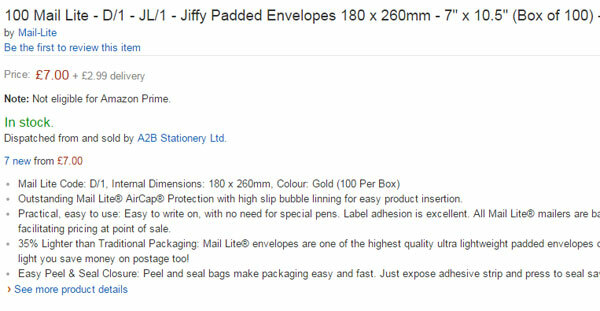 For example Sealed Air, the manufacturers of the Mail Lite range offer a protected barrier over the bubbles which offers much more protection through the post to other cheaper ranges where you could find that the product could end up being sent in an envelope with no protection at all. For the 450mm x 350mm x 160mm Royal Mail Boxes it really does again matter as to what type of cardboard the boxes are made of and what type of flute they have in the board plus the paper grade etc etc but as hardly any sellers state this it would be hard to review that, but again some cheaper prices in my opinion would reflect a cheaper grade board being used. The biggest of all of these products when quality matters is with the mailing bag, the ones that you have added as the cheapest I have bought and they are very poor quality, they really are nothing more than a cheap bin bag with a seal strip. If you want to make a good business decision with regards to packaging then in my view this certainly would not be an option as it really does give a bad image to your business as it literally is like sending your goods out in an old bin bag. The thickness, the polythene properties (are they made from virgin material or recycled material), have they been treated so that labels will not fall off in the postal service or ink smudge when you have written an address. Many of the cheaper bags that you have included are made from the thinnest recycled polythene film and the bags will tear, the seals will potentially come undone, labels could come off and addresses lost (resulting in missing deliveries) and the bags could stink of smoke. Bubble Wrap is the same as the bubble envelopes you were discussing and I have already mentioned, some cheaper rolls are not protected and the bubbles dissolve away before they even get to you let alone before you get to wrap your goods up. Packaging Tape is also a prime packaging product and there are cheap rolls and then there are good quality rolls, again the cheapest rolls will usually mean that they have an acrylic glue which is water based and means in colder conditions will not stick well (especially to paper or board ie boxes) The branded rolls are again much better and in my opinion are by far the better option because you simply use less per parcel as you do not have to wrap it again and again over itself to get it too stick. I just wanted to send this over to you as I do like reading articles like this but I think this quality issue should definitely not be dismissed as it really does matter. I agree that Ebay is up there for where to look but I would add that once you have found a good supplier where you are happy with the quality then you should contact that seller direct and you should then get the same product, same service but off Ebay through there own website at a discounted price. That is what I do and nearly all offer a cheaper price for selling off ebay. Thank you Andrew though for an interesting article. Many Thanks for your comment & insights Ralph! As I already mention in the article, quality IS important and you should always buy small/test batches first from new suppliers. This was more about pricing/cheapest materials type of article but I totally agree that quality should come first anyway. Hi Andrew how is this possible i would like to do this can you suggest. whats the cheapest way to import 50 pieces of iphone cases from china (the question is mainly related to shipping expenses–how can i minimize that from china to the usa? and the cheapest way to ship them here to customers domestic inside USA .lets say 1 case to a customer? The cheapest way to send 50 iPhone cases from China to the USA will be via China regular mail. It is very cheap but does not come with any online tracking plus it’s really slow (3-4 weeks on average). Next best option would be EMS courier (handled by USPS in the States). This will be more expensive but comes with racking and delivery will be just 4-6 business days. In USA, you want to use USPS services as they’re cheapest for such small, low value/size items. One of the most important articles. Andrew, you really know what we need. 1) When is the best time in an ebay business to start with custom designed Cardboard boxes (colours) as a part of branding? Does it makes sense to begin with that from starting the business or after proving the business idea and make sales? 2) How can I source these custom designed boxes cheaply? From China (alibaba.com) ? 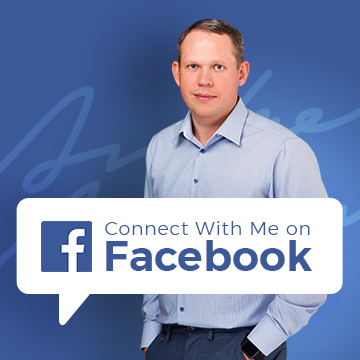 In most cases I recommend it leaving to a point where you’re already making sales and have some spare cash to invest in branding. As usually people don’t have enough money to buy stock in decent volume, not talking about custom packaging. It’s better to spend extra money on products, get them for cheaper prices than packaging. But in some cases you can do it from day one, yes. For example if you’re working with a decent capital which is more than enough to buy goods. Or for example if your overall strategy is based on branding – like your own brand cosmetics, beauty product. China is good for this only if you can buy at least 10k, 20k, maybe even more boxes at time. Otherwise stick with UK based companies as shipping costs from China will eat up all of your potential savings. What a fantastic article! Thanks for the links and the price comparisons.